1.Begin by finding the polka dot sheet inside the First Edition Pick n’ Mix 12x12 paper pad, this will be your background. 2.With the First Edition Torn Edges die set, cut out nine squares using the second smallest die in the pack onto a selection of 6x6 First Edition Pick n’ Mix papers. Repeat this step with the smallest die in the set and die cut 9 squares. 3.Layer the small squares you just cut out onto the larger squares. Mix the designs to achieve an alternative design. Once done, turn each square to form a diamond shape and glue them to your Pick n' Mix page in rows of three. 4.Choose a patterned sheet in the First Edition Pick n’ Mix 6x6 paper pad and cut out a 15cm x 5cm piece. Adhere this with 3D foam tape vertically, to the top right corner of your layout. 5.Next, cut a coordinating 6x6 Pick n’ Mix paper down to 10cm x 10cm and then cut your chosen photo down to 8cm x 8cm. With glue, stick your photo to the centre of the square and then layer your finished piece to the centre of your first strip. 6.Find a scrap piece of ribbon, cut the corners diagonally on both edges. Fold it over and when happy with how it looks, glue it together to secure its’ shape. Place your finished ribbon in a Dovecraft Serendipity peg and then glue a Simply Creative heart button to your peg. Clip your peg to the top of your layered photo. 7.To create a collaged effect, cut a 2cm x 5cm strip from the 6x6 Pick n’ Mix paper pad and glue this to your layout horizontally, to the left hand side of your photo, towards the bottom. 8.Cut a Dovecraft Floral Muse frame ¾ of the way and then layer the smallest part across the top edge of the frame. This will help you achieve a 3D effect. Glue your frame towards the bottom left hand side of your photo, add a resin flower from the Dovecraft Forget me Not collection to the bottom left hand corner of the frame. 9.Cut a green doily in half from the Dovecraft Serendipity collection. Glue this to the bottom left hand corner of your layout. Cut a 2cm x 10cm strip and a 1cm x 7cm strip of Pick n’ Mix paper, ensuring to use different patterned sheets. Diagonally cut off an edge from both and glue the smallest strip to the centre of the larger one. 10.Stick your finished strips to the centre of your doily, horizontally and finish by layering a few Dovecraft Bright Spark flowers together with glue. Add a Dovecraft Forget me Not resin flower to the centre to add dimension. 11.Next, cut a 9.5cm strip of Pick n’ Mix paper and cut a fish tale end at the top and bottom. Glue it horizontally, in the centre of the top left diamond on your layout and layer on a Simply Creative flower. 12.Cut a small length of Dovecraft twine and loosely wrap it around your finger to create a rough loop. Glue this to the bottom right diamond, in the centre. Cut a 1cm x 5.5cm strip of Pick n’ Mix paper and cut the right hand edge diagonally. Stick this to the left of your diamond with the twine, with 3D foam pads. 13.Decorate your diamond by attaching a Dovecraft Serendipity peg to the twine and a small Forget me Not resin flower to the left hand side of the strip. 14.It’s time to die cut your sentiments on to various colours within the Dovecraft Junior Craft Foam pack! Using the First Edition Modern Alphabet Dies, die cut the letters to create the words- ‘Life’, ‘Is’ ‘the’ & ‘Love’. Next die cut the letters to create ‘Life’ & ‘About’ from the First Edition Varsity die set. Lastly die cut the letters to make the word, ‘Journey’ with the First Edition Script Alphabet dies. TIP: It’s up to you whether you’d like to use different Alphabet dies on your layout but it’s not a necessity. 15.Glue the word ‘Life’ made from the Modern Alphabet dies across the strip on the twine. Glue the word ‘Love’ in the middle of your flower on the top left of your layout. 16. Finally, stagger the words ‘Life is about the Journey’ across the left hand side of your layout. Finish by decorating your page with Simply creative gems, Dovecraft Back to Basics Bright Spark buttons and Forget me Not resin flowers. The First Edition Pick n' Mix designs are so much fun to use for your scrapbooking and Katie has offered some fab ideas on how to create a colourful layout! 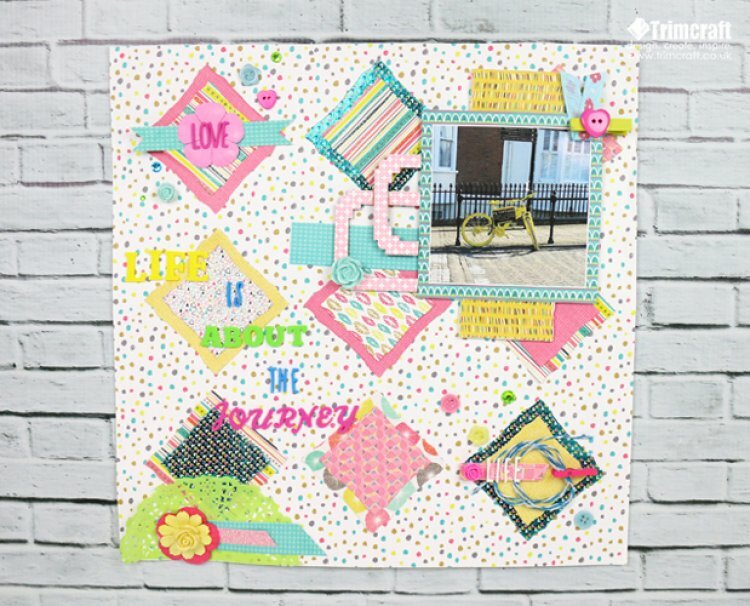 We'd love to see how this tutorial has inspired you, so make sure to upload your scrapbook pages to the project gallery and to #Trimcraft when uploading on social media!